In May 1915, London was attacked by German Zeppelins. Further raids followed. The Lord Mayor of London, Sir Charles Wakefield, offered a prize of £500 for whoever shot down the first zeppelin in Great Britain. On the night of March 31st, 1916, gunners at Purfleet, protecting the Royal Gunpowder Magazines, engaged anti-aircraft fire against Zeppelin LZ15, damaging the airship so badly she finally crashed in the sea at the Nore. Seventeen survivors were rescued and imprisoned. Captain J. Harris of the Purfleet garrison put in a claim for the Lord Mayor's prize, but the War Office ruled that gunners could not get a money prize for doing their job. 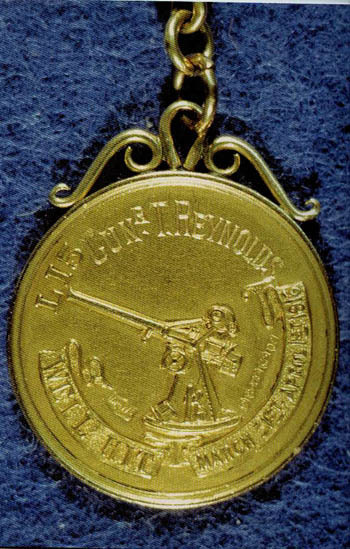 Instead, the prize was converted into gold medallions, which were given to each of the Purfleet gunners who engaged the enemy that night. The medal is inscribed "Well Hit, LZ15 31st March 1916". 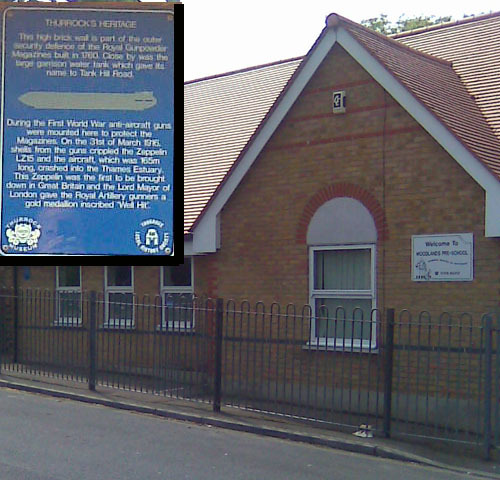 A blue Thurrock heritage plaque marks this event, erected before the current scheme. It is fixed to the wall of the Woodlands pre-school in West Thurrock. This stands close to the site of the large wall that used to surround the magazine site near which the anti-aircraft guns were mounted. As part of the commemorations marking the 100th anniversary of the Great War, a second (green) plaque was produced in the design of the current series. This was unveiled in April 2016 at the Purfleet Heritage Centre by the then Mayor, Sue Grey. A more complete account of the incident was published in an article in Panorama by Jonathan Catton, published in December 1999 under the title "Well Hit!"